These cookies started out as an attempt to clean out my pantry. Too many baking whims and enticing recipes in the past few weeks have caused me to accumulate an inordinate amount of ingredients that I rarely use up. This means that a glance into my refrigerator or baking cupboard will reveal items such as half a tube of almond paste, a nearly-full bag of sorghum flour, an opened bag of white chocolate chips, both sweetened and unsweetened coconut flakes, and almost an entire quart of whole milk which I bought for a recipe that only needed 1/3 cup. The day that whole milk becomes available in baking-sized amounts will be a very happy day indeed. All that clutter led me to be responsible for once and instead of loading up on more special ingredients of which I would use only a teeny-tiny pinch and then leave to waste away in my black hole of a kitchen, I decided to make do with what I had. I hadn’t made cookies in what seemed like forever (we’re talking way back at the end of June, for goodness sake!) so a cookie fix was definitely in order. An open bag of miniature chocolate chips in the pantry made chocolate chip cookies a logical choice, so that’s where I started. To add a little something extra to the cookies, I opted for browned butter instead of the melted butter called for in my favorite thick & chewy chocolate chip cookie recipe. I used dark brown sugar (which leads to more depth of flavor and chewiness) to enhance the nutty, caramel-like flavor of browned butter, and added in some toasted coconut for even more nuttiness. The mini chocolate chips provide bits of chocolate in every bite, which is always a good thing, and I used half whole-wheat flour to give the cookies a richer, deeper flavor and texture. 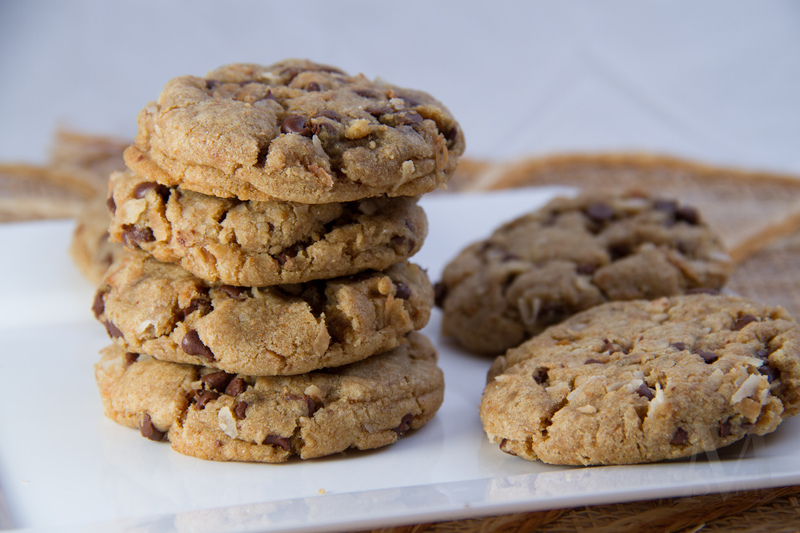 The extra egg yolk in the recipe makes the cookies super chewy, and chilling the dough makes them incredibly thick. 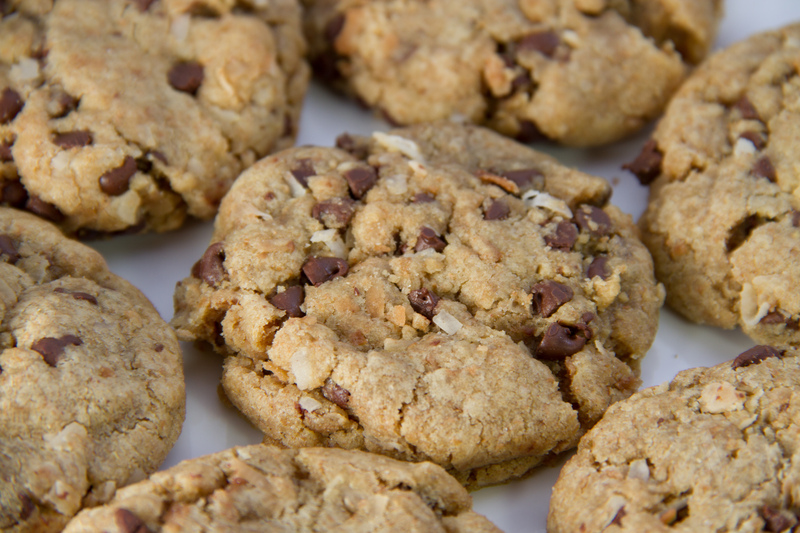 I’ll take a thick, chewy cookie over a thin, crispy cookie any day! Not only did I save a some money (and cupboard space) by not buying new ingredients for today’s recipe, I ended up with an incredible new cookie recipe! 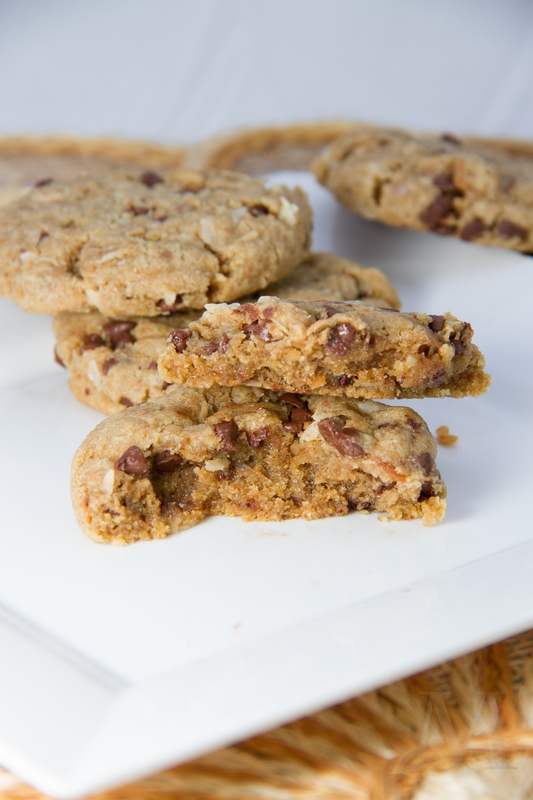 If you’re looking for a thick & chewy chocolate chip cookie taken up a notch in flavor and texture, look no further. Who knew that cleaning out the cupboard could result in the birth of such a delicious treat? Preheat oven to 350 degrees F. Line a baking sheet with parchment paper or aluminum foil and spread the shredded coconut onto the sheet. Cook for 8-12 minutes, tossing the coconut halfway through, until coconut is golden-brown. Turn off the oven and let the toasted coconut cool. Meanwhile, melt the butter in a medium saucepan over medium heat. Cook the butter, whisking frequently, as it bubbles and foams. Continue cooking until the butter turns amber-brown, tiny dark flecks appear, and it develops a rich, nutty aroma. Immediately remove the butter from heat and cool until lukewarm. In a medium bowl, whisk together the flours, baking soda, and salt. Set aside. Scoop the dough into 2-tablespoon-sized portions and roll into balls. Place the balls on a dinner plate, cover with plastic wrap, and refrigerate for at least one hour. When ready to bake, preheat oven to 325 degrees F. Place the chilled dough balls onto lined or greased cookie sheets and bake for 12-14 minutes or until edges are set and tops are no longer shiny. Err on the side of under-done! If cookies are too puffy, slightly flatten each warm cookie with the back of a spatula. Let the cookies cool on the sheets for 5 minutes before transferring to a cooling rack. Enjoy! 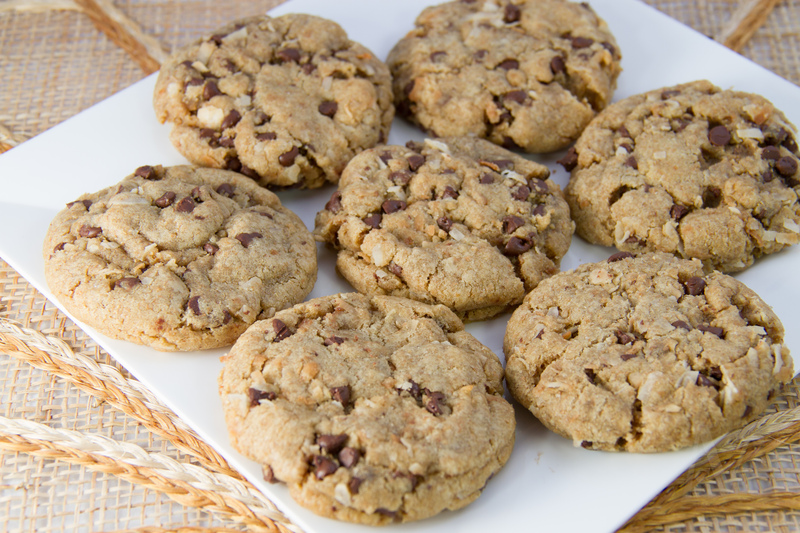 This entry was posted in Cookies and tagged browned butter, chocolate chip cookies, cookies, desserts, mini chocolate chips, shredded coconut, toasted coconut by emmasbakingaddiction. Bookmark the permalink.